Today recipe was not just good but it actually brought our family together for a night of tree decorating, shopping and having fun. The day started out with a text from me, saying we are having lasagna for dinner tonight and then we are getting a Christmas tree! No if, ands or buts about it! Sure enough everyone got together around the table and we ate the most wonderful, simple lasagna dinner and then my Husband and his daughter went out and got a Christmas tree! It may not sound like much, but trust me, it is really hard to get my family to do things together because of everyone’s work schedule. The lasagna dinner that started it all, was my Three Cheese Meat Lasagna. 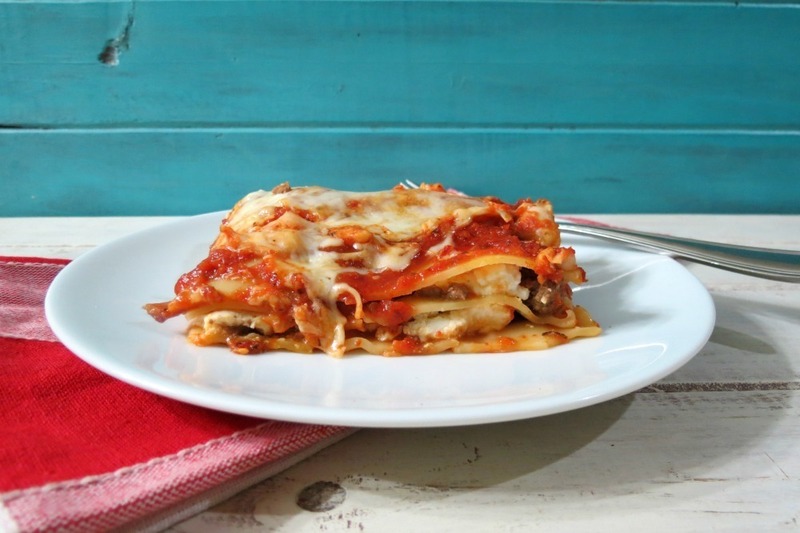 It’s rich, thick, cheesy, meaty and just amazing! 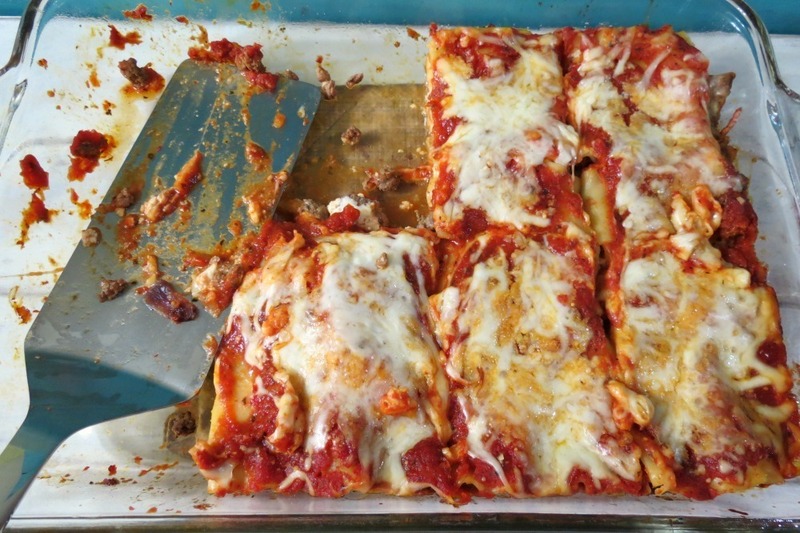 My Husband told me, I am not a lasagna person. Well this recipe changed his opinion. After his first bite, his exact words were tell Barilla that I love them and thank you so much for real pasta noodles. This is true, he really did say that! Little Jenny said this is amazing and asked for the recipe because she wanted to make it for her boyfriend. Wow, I never had so many compliments on a dinner! This is a picture of the first serving from the pan. This is what it looked like when it was done and my Husband said, save the leftovers, I’ll eat it tomorrow! Three people, 8 servings, two slices left! Yes you can say this was a hit! 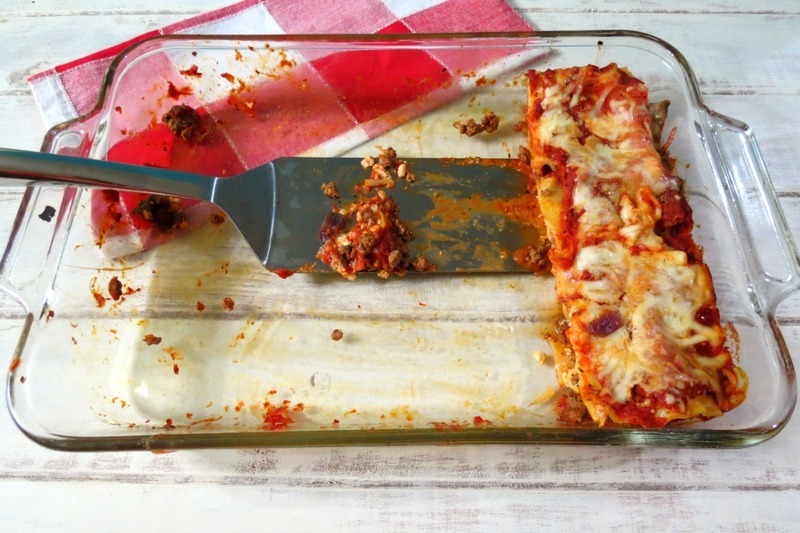 So what made this lasagna so good? I used Barilla Lasagne Noodles and Barilla Tomato & Basil All Natural Pasta Sauce. This was the first time I ever boiled my own lasagne noodles and wow, they turned out really good! I thought they would break apart, but they didn’t! While the pasta was cooking, I cooked some ground beef with onion and garlic for a little flavor. Once the noodles were done I added to my baking dish and topped with ground beef and ricotta cheese. I poured the Barilla Tomato & Basil All Natural Pasta Sauce over the top and then topped with part-skim mozzarella cheese and Parmesan cheese. Here it is just before going into the oven. I baked it for 40 minutes and let it cool for 5 minutes. Let me just tell you, as soon as the buzzer went off, my Husband and Jenny were sitting at the table waiting!! I took my pictures and they were just waiting, with weird looks on their face. Jenny waited for me to eat, but my Husband dug in. This truly a wonderful pasta dish and my family couldn’t get enough of it. If you like cheese, this is sure to please your palate! 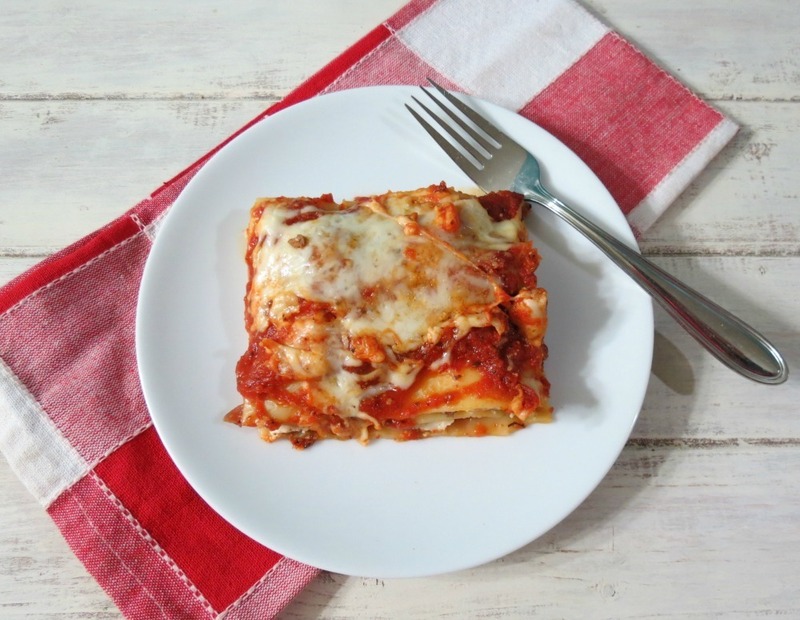 The lasagna makes for a wonderful week night meal and a great meal to have with your family. I am really proud of this dish and I was so happy we had dinner together. It’s probably been almost a year since we all sat down together. I know it sounds ridiculous, but Jenny works most nights, so it’s always Hubby and I. A thick, saucy, meaty, cheesy Italian pasta dish made with lean ground beef and Barilla Tomato and Basil Pasta Sauce. In a large pot bring add 6 cups of water and a pinch of salt and bring to a boil. 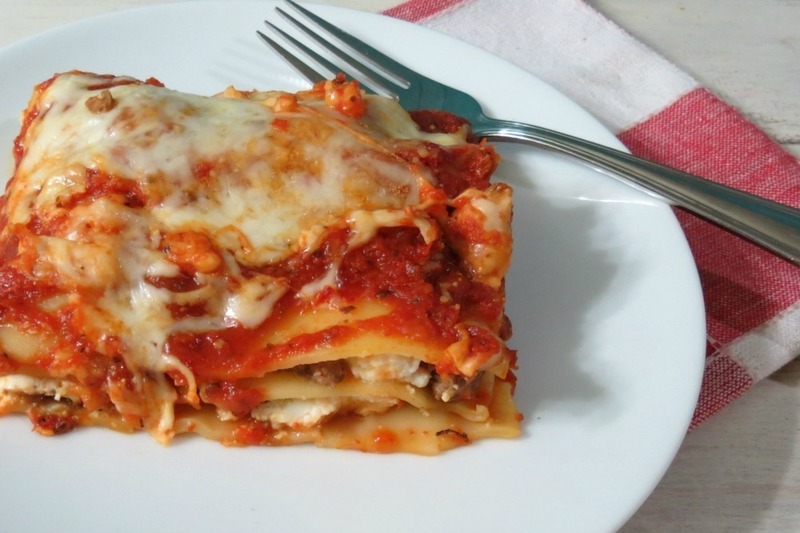 Add lasagna noodles and cook for 8 minutes until noodles are soft. Meanwhile in a skillet, add ground beef, onion and garlic and cook until beef is no longer pink. Drain the fat. Spray a 9 x 13 baking dish with cooking spray. Spread about a ¼ - ⅓ cup of Barilla Tomato & Basil All Natural Pasta Sauce to bottom of dish. 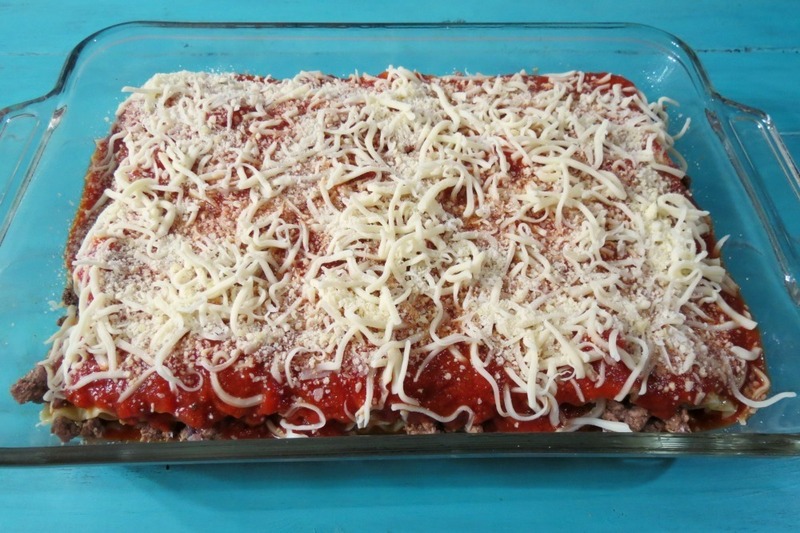 Add 3 lasagna noodles to the bottom, top with ½ the ground beef mixture, top with half the ricotta cheese, top with 3 more lasagna noodles and remaining ground beef and remaining ricotta cheese. 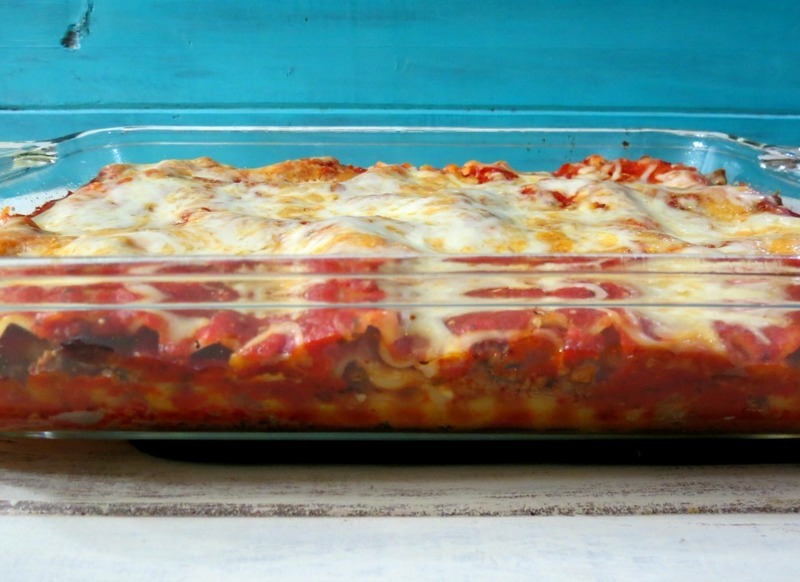 Top with 3 noodles and pour Barilla Pasta sauce over the top and spread until evenly layered. Sprinkle top with mozzarella cheese and Parmesan cheese. Cover with aluminium foil and bake for 40 minutes. Uncover and bake 15 - 20 minutes until cheese is bubbly. Let the lasagna sit for 5 minutes before cutting. 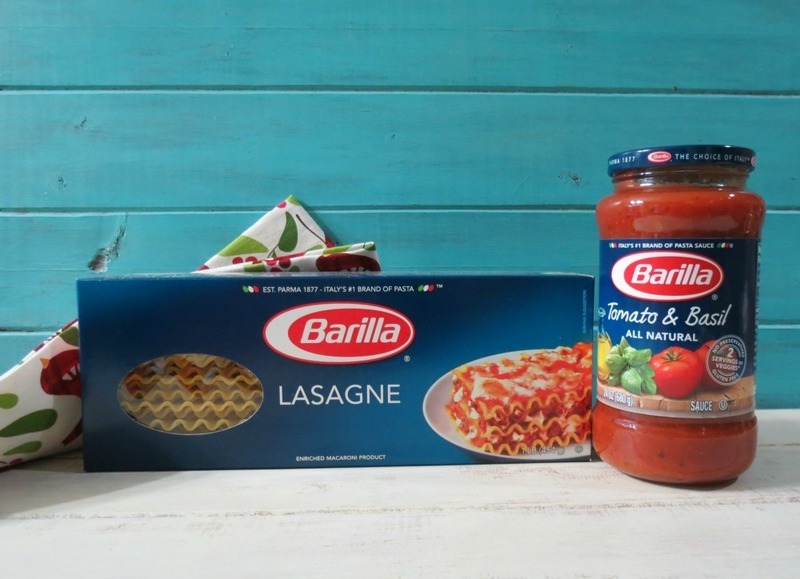 To get more pasta ideas and recipes, stop by Barilla’s Facebook page and tell them I said hi!! What is your favorite kind of lasgana? Do tell, maybe I will make that kind next? 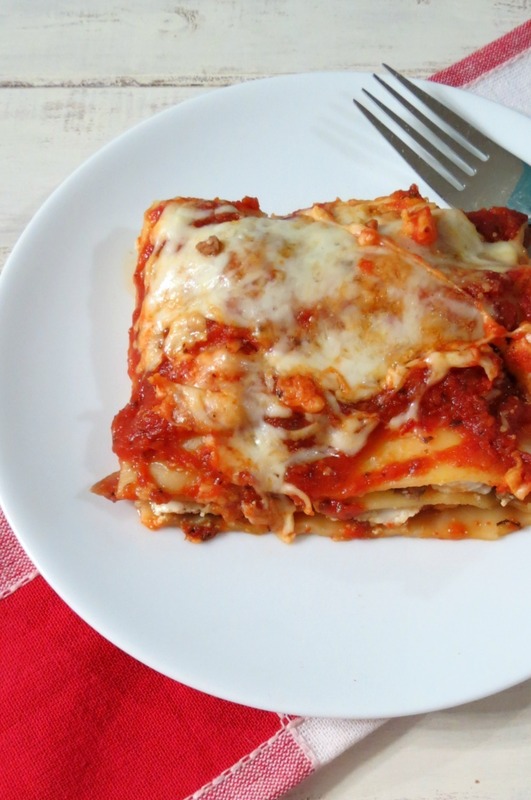 I haven’t had lasagna in so long and this is just drool-worthy!! The stats don’t look too bad either. Looks tasty. Are you not dairy-free anymore? Hi Charlene! No I didn’t cover it. If it looks like it’s browning to quickly, than yes cover it.